They say that the environment of Molo 21 is conditioned by the sea, so when we got to work on the restaurant logo redesign, we felt it was important to ensure that the sea played a big part. The final result was one that embodied everything that Molo 21 believed in: Creativity, Intimacy and, of course, the sea were all incorporated in to the final design. The sense that Molo 21 and the sea are actually intertwined is evident in this logo. With this new restaurant logo design, marketing collateral was designed and printed by Smart. 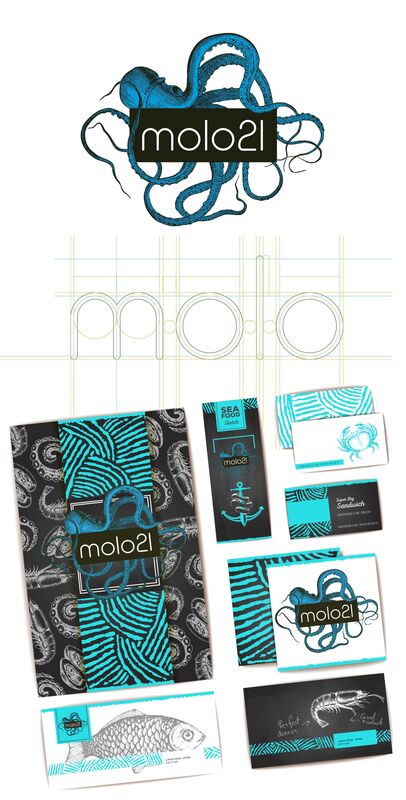 Again, incorporating many of the same features as the logo, the printed items would continue to remind the viewer of everything that makes Molo 21 what it is. With a printed menu, business cards, letter heads, personalised napkins and even a printed chalkboard, everything was aligned to create a complete brand image.